Life On Mars? (live, 1972). Life On Mars? (rehearsal, 1976). Life On Mars? (Tonight Show, 1980). Life On Mars? (live, 1983). Life On Mars? (broadcast, 1999). Life On Mars? (Net Aid, 1999). Life On Mars? (VH1 Storytellers, 1999). Life On Mars? (Glastonbury, 2000). Life On Mars? (Parkinson, 2002). Life On Mars? (live, 2005). Life On Mars (The Bad Plus, 2007). Life on Mars? (Lorde, 2016). David Bowie on “Life on Mars,” 2008. Nice indeed. “Life on Mars?,” as fits its cinematic lyric, has become the Citizen Kane of Bowie songs—the youthful masterpiece, the epic, the best thing he ever did. Popular television shows have been named after it, people have gotten married to it. It (quite literally) is Bowie’s own version of “My Way”—longtime readers may recall Bowie’s chrisom child “Even a Fool Learns to Love,” his attempt to write English lyrics for Claude François’ “Comme d’Habitude.” Bowie’s translation was trumped by Paul Anka’s, which turned François’ stoic Gallic lyric into a grandiose self-assessment, perfect for Frank Sinatra’s late imperial phase. 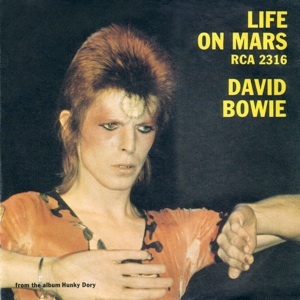 Bowie was nettled by the snub though, and a few years later he rewrote the song as “Life On Mars?”—brazen enough in his theft that he wrote “Inspired by Frankie” on the LP cover. In Bowie’s lyric, a sullen teenage girl is sent off to the movies by her distracted parents, gets stood up by her friend (maybe her boyfriend) and dejectedly takes her seat in the stalls. It’s one of the few early rock-era songs in which a girl is simply the subject of a song, not an object of beauty or lust or distraction, and Bowie also neatly captures the essence of a teenager’s life: filled with slights and petty injustices, the constant restlessness (take the way nearly each line starts with a new conjunction), the ingrained tedium of your narrow world. And the song also captures a teenager’s ability to suddenly and completely lose themselves in art, to a degree we can never quite do again. It’s what happens, suddenly, as the girl sits bored in her seat—the movie screen comes alive, showers her with images, flatters her, distracts her, wins her over against her will. It’s what happens in the song as well. Bowie constructs an 8-bar bridge designed to build anticipation in the listener—the strings, the pounding piano, the rising chords in each new bar—and then makes good on his promise: the chorus, starting with Bowie vaulting nearly an octave to a high B-flat and ending with another high Bb, held for a brief eternity, is one of the most gorgeous melodies he ever wrote. The careful imagery and the intricate design of the first verse—its movie theater setting, its mousy heroine—vanishes in the second, replaced by a string of jokes (“Mickey Mouse has grown up a cow” made Trevor Bolder and Woody Woodmansey crack up in the studio), esoteric references and gibberish (“my mother, my dogs and clowns”). A cynic would argue that Bowie didn’t have a second verse and just free-associated in the studio; a more charitable interpretation is that the second verse is from the point of view of the movie screen itself. Blank and fecund, the screen offers nothing but a string of disconnected, vivid, absurd images: the masses scurrying from Ibiza to the Norfolk Broads (from a hip summer holiday destination to an old-fashioned one), Mickey Mouse, “Alley Oop” (from which Bowie stole the “look at those cavemen go” line ), crooked cops and honest robbers. 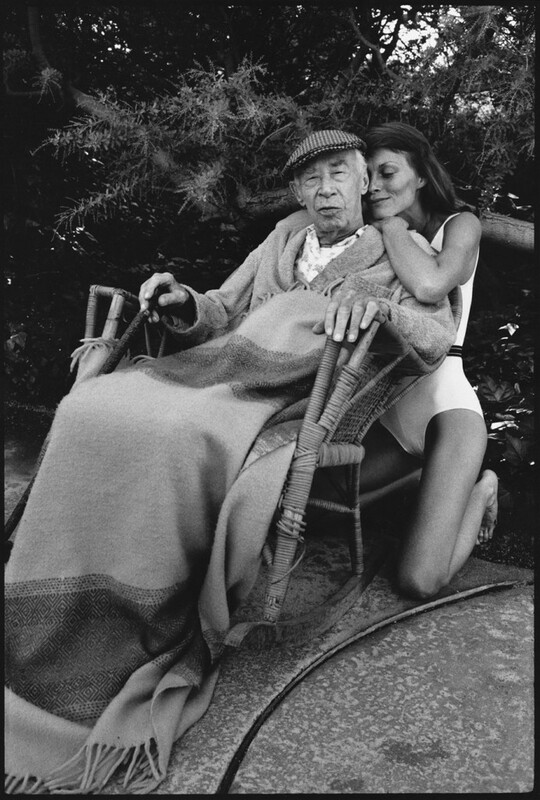 It could be a curse on modern life, in which a discontented girl is stunned into silence by colors and noise, or it could argue that even the basest pleasures have nobility in them. I’d say “Life on Mars?” turns out to be a love song after all—the girl in the stalls, the screen providing her cheap dreams, and the song that unites them, which in turn becomes the stuff of our own daydreams and idle hopes. There is an art to the building up of suspense. Tom Stoppard, Rosenkrantz and Guildenstern Are Dead. “Life on Mars?” is a case in point. The suspense starts in the very first bar, where there’s a single piano note (A), a rest and then two notes that Bowie uses as the first words of his verse (“It’s a/godawful small affair”) and every following line has the same two-note intro (“But her/friend is…,” “And her/daddy…,” “And she’s/hooked to the…,” “She could/spit in the eyes…,”). The result is that there’s always a sense of motion, with these “empty” bars suddenly leading to the next line. In the bridge, Bowie drives toward the chorus slowly and relentlessly: there’s the two-note intro again (“But the/film is a saddening bore”) and suddenly strings hit on the first beat (on “film”), as does Bolder’s bass, while Rick Wakeman’s piano, which has up until now been offering brief ascending and descending lines of notes, drums out chords. The chords are stacked upward to the chorus, moving from A flat to an augmented E to G flat to an augmented A, leading to the sudden vault (in Bowie’s vocal) from D to B flat (“fo-cus on/SAIL-ORS“). Even in the chorus Bowie’s not done with the anticipation, as he comes back to the high B-flat again but now briefer (“OH man”), repeats his first leap, now moving from E to B (“LAW-man”). Finally, at last, comes the release—the three-bars-long B on “MARS!”, a brutal endurance test (Bowie’s voice slightly wavers on the first chorus of the LP cut) that ends the chorus and seems what the whole song has been leading up to. Ronson’s cascading string arrangement was based in part on the descending bassline that Bolder had worked out in rehearsals, while in turn Woodmansey’s drums respond to the strings—he does some tympani-like fills to match the staccato string bursts, and even ends the track by quoting the tympani of Strauss’ “Also Sprach Zarathustra” (a Bowie perennial by this point—similar tributes are in “Width of a Circle” and “The Supermen”). Wakeman, playing the same piano that Paul McCartney used for “Hey Jude,” offers a secondary melody line for much of the verses. Ah, you can spend hours on the details: the lovely wind (or is a synth?) accompaniment in the second verse; or Ronson’s gorgeous,vibrato-filled guitar solo that links the chorus and the verse; or the way Wakeman suddenly drives the rhythm midway through the chorus, pounding eight identical chords over four beats (while the piece oddly moves from F major to F minor). “Life on Mars?” naturally gets a Hollywood ending: sweeping strings, the 2001 drum fanfare and a fadeout. But we still hear Wakeman’s piano in the distance, playing a bit of his chorus line, until a phone rings, someone mutters and we’re left awake and alone. Recorded June-July 1971; released as a single by RCA in June 1973 (RCA 2316; it hit #3 in the UK, helped by the Mick Rock promo linked to above). While a huge hit in the UK, it was never that popular in America, oddly enough. Bowie performed it occasionally during the Ziggy tours of ’72-’73 and then retired it until a Tonight Show performance on 5 September 1980 that has, for me, Bowie’s finest vocal for the song. Also revived in 1983, 1990 and some recent tours. It’s also been regularly covered over the years, even by Barbra Streisand. The recent version by The Bad Plus (from Prog) is highly recommended. 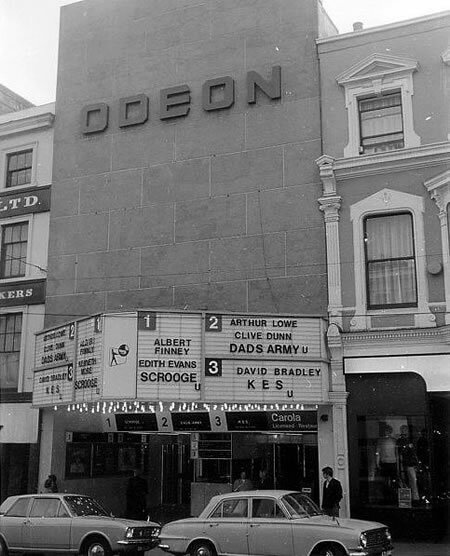 Top: The Nottingham Odeon, 1971.